Dr. WONG Kwai Yau - Online mental health support for youngsters - "Open up"
No Lunch provided. No refund for registration fee. E-certificate will be provided upon request after completion of all lectures. Professional Forum on Child Health 2018 IB and DSE - is this a Fair System for University Entry? Dr. Christopher LEUNG - IB and DSE - is this a Fair System for University Entry? "Hong Kong Paediatric Nurses Association Ltd."
Professional CME Meeting on Child Health 2017 HPV Vaccination in Girls: Who, What, When, and Why? Professional CME Meeting on Child Health 2017 - Managing Severe Atopic Dermatitis in Children: What disease is that? Members & Invited Guests are Welcome! Food allergy - are we at the beginning of the end? 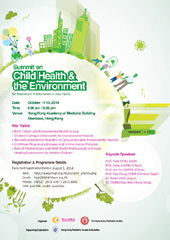 Professional CME Meeting on Child Health 2016 - Kindergarten Education for Hong Kong Children: Is It Physiologically Appropriate and Is It Developmentally Sound? All Professionals on Child Health are Welcome. All Professionals, Nurses and Health Care Professionals are Welcome. Seats are limited. Please make registration. Critical appraisal of the Inclusive Education in Hong Kong - what have we achieved and how can we do better? Is current education system in Hong Kong compatible with optimum child growth and development? How to include child health elements into Primary education? How to consolidate the concepts of preventive health care in Secondary education? How does poverty affect the health of children?